Members of IAEP Local R5-077 recently ratified a new workplace contract in Volusia County, Florida. The new agreeement guarantees significant financial gains for members of Local R5-077 and incorporates EMT field training officers into the contract. This is the third contract to be ratified by this bargaining unit, who are employed by Volusia County EMS (EVAC), the primary 911 provider for area residents and visitors. Support for the three-year agreement was evident as 96% of members voted favorably. “The members were very happy with the successor agreement and negotiations went well,” said Ken Skaggs, representative for the IAEP, who worked with Chief Negotiator Scott Schaub to negotiate the contract alongside local union leaders and management. 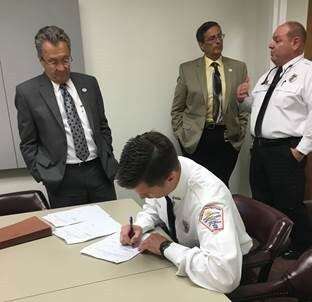 Local President Jason Lademann met with county council and management from Volusia County EMS on September 8, 2016, to provide a signature that would officially ratify the contract for the next three years (pictured below). Throughout the event, Volusia County EMS management expressed thanks to the IAEP negotiation team for their professionalism and hard work. “They got ahead of some of the issues. I do think that this is the way negotiations should take place,” stated County Manager Jim Dinneen during his statement to the County Council. Listen to statements from the County Council meeting on September 8, 2016, here. IAEP Local R5-077 President Jason Lademann signs the CBA as Tom Motes (Director of Human Resources for Volusia County EMS) looks on.